La loves dolls she has so many I’ve lost count and I can never keep up with their names they change so often, so when I asked her if she’d like a baby born interactive sister doll, of course, she said yes. 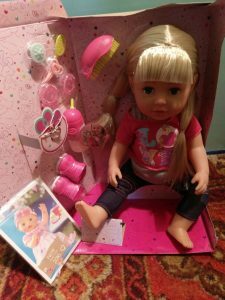 When the doll arrived the first thing I noticed was how well packaged it was and how many accessories it had with it. 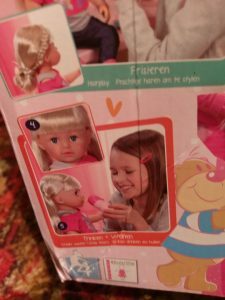 LA first noticed how long the hair was on her new baby. 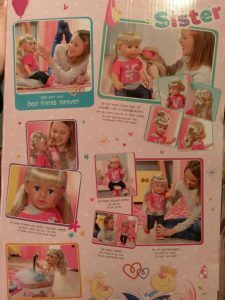 The doll came with matching bracelets, one for the child and one for the doll, shoes, a baby bottle, two springy bracelets/hair bobbles, a hair brush and three hair clips, as well as a brochure that shows the rest of the recent range of baby born dolls. From the packaging, we found out that if you feed the baby some water she will cry, we haven’t tried that out as LA doesn’t like the idea of upsetting baby, but if I get the chance to try it at some point I’ll let you know how it goes. Her long hair is awesome for styling we’ve braided it and put it in ponytails too, and her legs are so strong she can stand and sit on her own too. 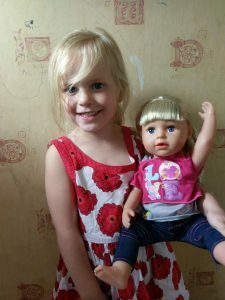 The doll is very well constructed and whilst LA plays nicely with her, her brothers play roughly and the doll has survived numerous falls from the top bunk of their bunk beds, being thrown downstairs and being bodyslammed by every Avenger known to man. This pleases me as a mum because I’ve lost count of the dolls I’ve found at the bottom of the stairs with body parts missing, and with prices starting at £32.99 durability is very important. She may be a little older than BABY born®, but she is just as tall as her, which makes it easy for them to borrow each other’s clothes. Of course BABY born® wants to try on the cool shirt with LOVE print, the comfortable leggings and the fancy sneakers right away. Her sister has a hard time deciding whether she wants to try on BABY born®’s casual Deluxe Jeans Collection or the dress with the A-line skirt first. She is able to stand on her own to present the dresses to her friends. BABY born®’s Sister’s joints are super flexible, because she absolutely loves going to her gym lessons. And of course, doing a lot of exercise is thirsty work. That’s why she brings her bottle along with her. She also likes to go swimming with BABY born®. If she hurts her knee during gymnastics or playing about, she can cry real tears.